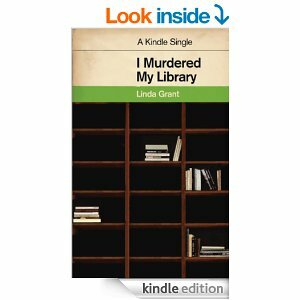 British author Linda Grant’s observations [in her short story I Murdered My Library] on downsizing her library in a slightly different way reflected my recent experience. She was moving after 19 years to a smaller flat and needed to divest due to downsizing. Her introspection while doing so became this small book. As well as the treasures, there are books I did not particularly care for, but kept anyway, or the books I bought but never read, or the books I started but did not finish, and put away in case I wanted to come back to them. Grant said that “[w]hen builders come in, or grocery delivery men, they often say, ‘Blimey, have you read all these books?’” The attorney for our insurance company asked me that (though he didn’t use the term “Blimey”). I answered, Personally? Maybe 3,500 (of the 5,800). Out of the whole family, probably 5,000. True story. There is a strong part of me which thinks that if you don’t have access to your books, you might as well not have them, as I believe that tidying things away where you can’t see them means there is no point in having them at all. We did have books stored away, but they were the pre-school and pre-teen books that we were saving for grandchildren. Other than those, all of our books were accessible. When a friend asked Grant why she actually needed all those books, she said, “If there is a need, it is not a functional one – it’s something else.” How true, for as our children outgrew the functional books, the books became something else to us, which is why we stored them. Memories for sure … and hopeful legacies to share with future grandchildren. My library is denuded. It doesn’t seem like a library. It feels … like the house of a person who reads, but not the house of a person for whom books have been everything. For the tension is that I no longer want books to do all the furnishing of my rooms. I want décor. Our old house had built in shelves on which were so many books, but we also had shelves throughout the house with stacks of books. Our rebuilt home does not have the large library infrastructure, and after a year, we are just now needing more shelves. But we have décor and I now prefer the understated role of physical books in our home. Important books. Books that are special to us. And of course, resources for our youngest two home-educated teens. Grant notes: “No books in the living room [of her new place]. Those walls are reserved for pictures, although it is the site where the reading actually takes place.” Yep. Because I am kidding myself if I think I am going to re-read a fraction of the books I have brought with me, or finish a fraction of those I have never got round to reading. Before the fire, I too often was fooling myself when I thought, “Someday…”. This is why we’re being very selective in what we replace in our library. Some can never be replaced, but some can…for new memories, and a few old ones.